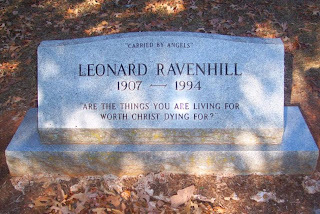 Leonard Ravenhill (1907-1994) was an Evangelist and Revivalist who offers a striking critique of evangelical church life in this old "Chapel of the Air" interview. You can really hear Ravenhill's influence on people like Paul Washer. Ravenhill is interesting. Sometimes consistency is lacking. On one hand, he can recommend the reading of Gurnall's The Christian in Complete Armour and Charnock's The Existence and Attributes of God. On the other hand, he seems to approve of the Finney's revivalism. Fewer than 2% of professing Christians are born again. How Frightening, does he offer any explaination or tools for self diagnosis? As about Finney, I think Ravenhill didn't approve of Finney's "revival even without the Holy Spirit". Ravenhill talks very much about the unction from God.